“Fox & Friends” took a victory lap on Monday after Attorney General Williams Barr concluded that the Mueller report did not find sufficient evidence of collusion or a criminal conspiracy between Donald Trump and the Russians. On set hosts and regular guests lauded as a complete exoneration of the president. Harvard law professor Alan Dershowitz, a longtime friend of the show, trashed some of the more breathless coverage of the Mueller investigation and said a lot of apologies were owned to the American public. “I think a lot of apologies are due to the American public about being misled by many in the media who substituted wishful thinking for factual analysis,” he said. 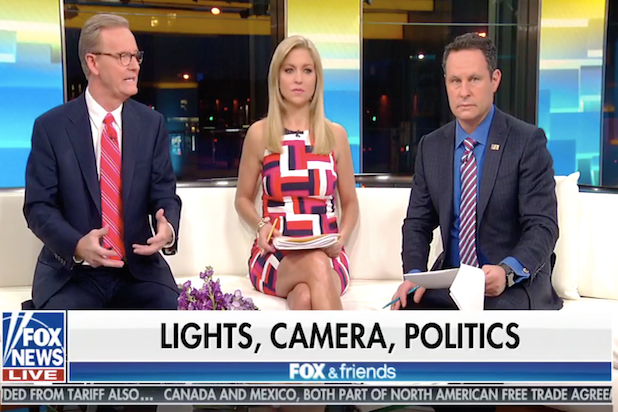 “Fox & Friends” hosts Brian Kilmeade, Steve Doocy and Ainsley Earhardt were in complete agreement. On Monday, it wasn’t just “Fox & Friends” who had the knives out for the mainstream media. MSNBC — whose anchors and contributors have spent years publicly suggesting additional indictments against Trump and his family were imminent — were also facing bipartisan blowback. Noted tech journalist Tim Pool accused much of MSNBC coverage of the Trump-Russia story of resembling Infowars. Reps for CNN and MSNBC did not immediately respond to request for comment from TheWrap.